← Little Joys Card and Blog Hop with Quietfire Designs! 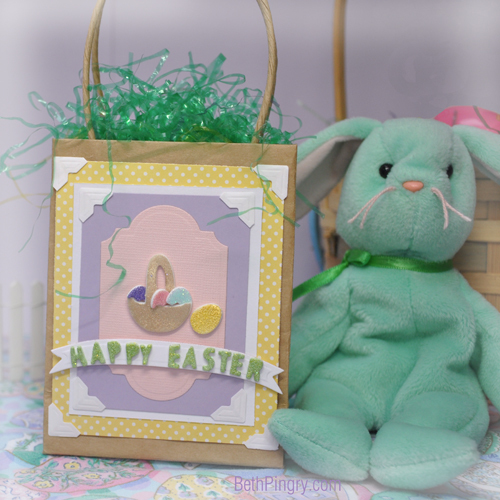 Today I’m sharing a project I made for CHA Winter 2014, a small gift bag with an Easter Basket embellishment. The shapes and Happy Easter are from the 3D Foam Easter Shapes, and I colored them with embossing powders from Sparkle N’ Sprinkle. The die cuts are from Spellbinders. I posted this on the Scrapbook Adhesives by 3L® Crafty Power Blog earlier this week. This entry was posted in Altered Art/Mixed Media, CHA, SCRAPBOOK ADHESIVES BY 3L, Spellbinders and tagged 3D Foam Easter Shapes, Bag, Easter, Easter Basket, SCRAPBOOK ADHESIVES BY 3L, Sparkle N Sprinkle, Spellbinders. Bookmark the permalink.